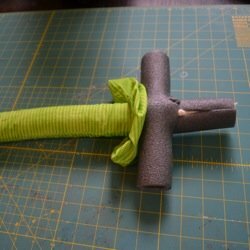 Make Safe & Soft Toy Pirate Swords for Play & Costumes! 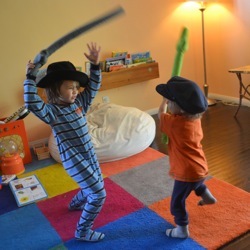 These toy pirate swords are soft and safe for little ones, unlike so many of the plastic toy versions on the market that I honestly don't want to introduce into my home. 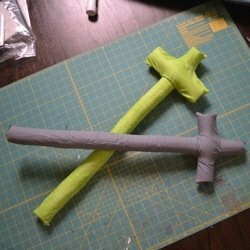 I'll admit it, weapons of any kind still make me a little squemish and it took me a long time to decide to even write this tutorial. But we've been really happy with these. My four year old uses his as part of his pirate costume and even my 18 month old loves to run around with his. They are soft and flexible and lightweight so that even when they play there is no risk of injury, which was my main concern. It was also really cheap to make these. I've seen those large pool float noodles recommended for these, but they are too large in my opinion and they cost several dollars per noodle. 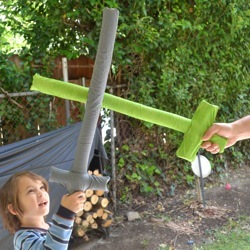 My version uses a tube bought from a hardware store (and made from the save exact material as the colorful pool noodles) but it only cost $1.94 which is long enough to make two toy pirate swords. 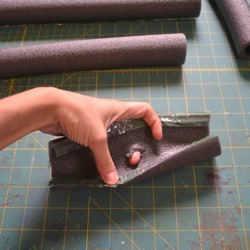 Materials Needed: 6ft of self-seal polyethylene pipe covering that fits 1/2" pipe. 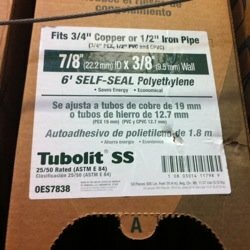 The brand I used was Tubolit SS and it was $1.94. 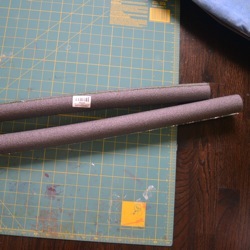 Then you'll need cotton (or poly or bamboo, etc) batting and cotton fabric the the cover. First, cut your tubing to 25" in length. Then you'll use the excess and cut an 8" pieces. Open up the tubing and find the center and poke a hole with scissors and the pull the end of the sword through the hole. This creates the handle! 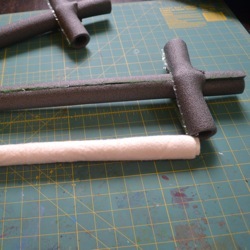 Next, take your cotton batting (or scraps of fabric, stuffing, etc) and roll it up and stuff it into the inside of the tubing. 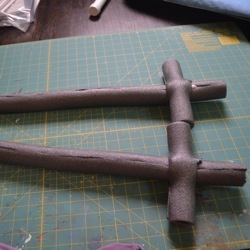 This creates a little more stiffness to the finished toy pirate swords so they aren't as floppy. They still will be soft and flexible though. 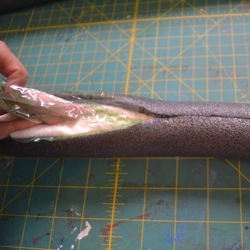 Once stuffed, start pulling off the seal tape and squeeze the ends together shut. Now the form is finished and it just needs to be covered with fabric of your choice! 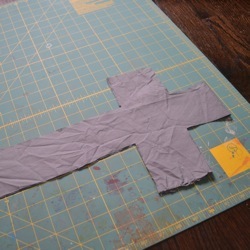 I just used cotton quilting fabric (no stretch) I had on hand, but feel free to get creative. You could use a different fabric for the handle for example. And metallic fabric would be amazing! 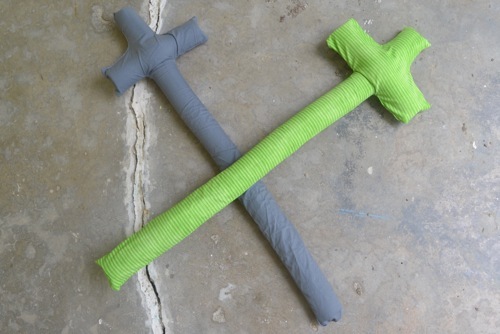 Here is the Toy Pirate Sword fabric cover pattern in PDF format for you to print and use. It will print on 3 pages of regular printer paper that you can tape together. Make sure you are printing without margins. 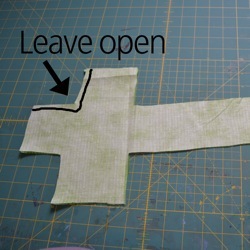 Tape your pattern together and trace it on your fabric, cut two and place right sides together to sew. Be sure to sew very close to the edge (1/8" of an inch is ideal) otherwise your fabric cover will be tighter and more difficult to slide on. 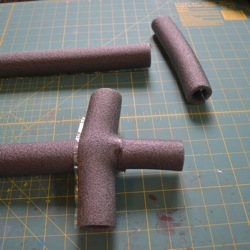 Sew all the way around except for leaving one side open on the handle to stick your sword form through. 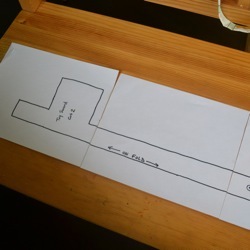 Turn right side out and start putting the form into the cover. It will be snug but should slide on with a little help. 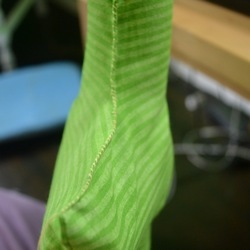 Finally, you'll need to hand sew the hole that was left and then you are done! 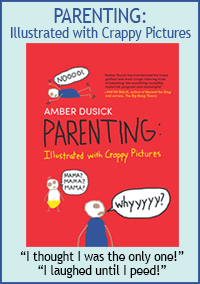 Go to the Kids Costume Patterns & Accessories Section for more fun ideas! And to the Handmade Baby & Kids Toys section for more play stuff. 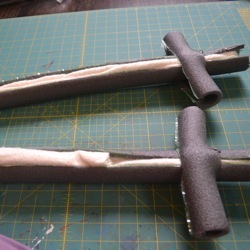 Back to the top of the How to Make Toy Pirate Swords page.